There is no bad way to eat butternut squash. Its warm Fall flavor is slightly sweet and when its full flavor comes out through roasting or sauteeing, it compliments so many other ingredients. I just have never met a butternut I didn't like. I know I should expand my squash repertoire and move into some other winter squashes, but I find that there is something so comforting about the butternut that keeps me coming back. It could be the pale salmon color and how great they look on the outside, compared to that eye-popping orange on the inside. (Orange happens to be my favorite color). So another quest for butternut recipes this week led me to this wonderful side dish that would allow me to use the last of my borlotti beans from Italy. 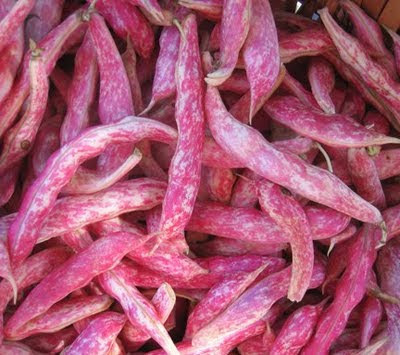 Borlotti are the beautiful red spotted beans called cranberry beans here. The color is wonderful and they look really cool when fresh and still in their pods. They have a color and a crunch that makes them the perfect compliment to softly sautéed squash and little bit of bitter greens. I'd seen a salad like this before in one of my cookbooks, but found this recipe on Marthastewart.com. As usual, I altered it to meet my needs. The recipe calls for bacon but I didn't have any and wanted to keep it vegetarian as I was serving it alongside a classic pot roast for dinner. The salad was also delicious cold the next day for lunch. Martha's recipe also called for broccoli rabe, which I love, but it is not yet available in my local market so I substituted kale from our farmers. 1. Beans (2 lbs) should be soaked overnight and then cooked with one onion, 1 bay leaf and sevel black peppercorns, with enough water to cover beans. Bring to a boil; reduce heat and simmer until cooked through about 25 min. 2. Drain beans, reserving a little cooking water. In a medium bowl, toss beans with 1 T each olive oil and cooking liquidl season with salt and pepper. Set aside. 3. Peel and cube 1 small butternut squash. Working in batches if necessary, sautee in olive oil until lightly browned and cooked through. Season with salt and pepper and transfer to a bowl. 4. Heat 2 T olive oil and add 3 garlic cloves, minced. Sautee until golden brown. Add kale or other leafy green, saute until wilted and heated through, about 5 min. Season with salt and pepper. 5. Add beans and squash to skillet and cook just until heated through and combined. Drizzle with olive oil before serving. Fall is definitely in the air and I love it. Ever since I moved to the South, I am happiest when the weather turns from hot and muggy Summer to crisp, clear and beautiful Fall. I really appreciate the change in seasons in the Southeast, not least because I get to cook new things! Now is the time for winter squash: butternuts, pumpkins, acorns and kabochas. I love them because they look and taste like Fall. Before I cooked so much, I used to buy them at farmer's markets and leave them on the counter or on a table on the porch and enjoy looking at them. But now that I try to cook and eat seasonally, I look forward to the arrival of squash and all the new ways I find each year to cook and enjoy them. 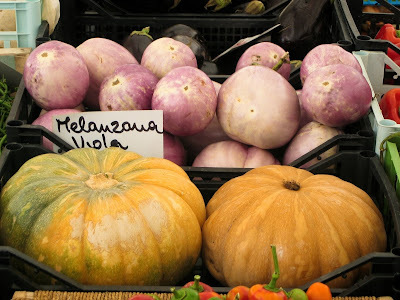 I remember being in Italy last Fall and being excited that the same winter squash that we have were found in all the markets (and the menus) over there. 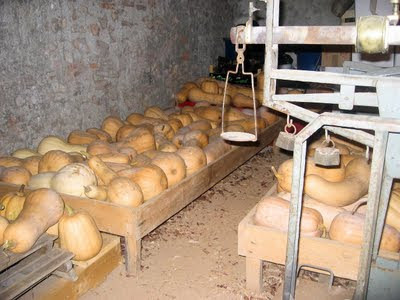 It was late September and we visited an organic farm in Tuscany where they had a storage room full of butternuts. I could think of nothing more than putting them to good use for torellini di zucca with sage butter sauce, perhaps my all-time favorite pasta dish. Butternut is my favorite. This week I had three on the counter from the farmer and one big one growing in my garden, so I thought I should get creative. I threw one in the oven, sliced in half, to roast while I thought about ways to use it for that night's dinner. Just then, Ben Frank posted a link on facebook to his blog with a recipe for a creamy winter squash soup. The photo was so beautiful I couldn't help but click over. There are a million recipes for butternut squash soup, but this one struck me as very unique. It combined the sweet flavors of roasted butternut, apple juice, roasted red peppers and the heat of cayenne peppers. In addition, it started with bacon! What could be better than that? So I immediately decided this was the soup for my roasting squash. I still had a few red peppers from the farmer and a neighbor had given me a handful of cayenne peppers from her garden last week. I threw the red peppers into the oven to roast along with the squash. I followed Ben's recipe exactly, except I substituted a cup of chicken stock for the cranberry juice. But I did use apple juice for the rest of the liquid as he calls for. At first I thought that would be a weird addition for an already sweet soup, but because of the spiciness of the peppers, the apple juice was a welcome sweetness and of course, the flavor of apples and bacon cannot be beat. I raved about this soup for a while after dinner. I liked it so much I even brought some in a small container to my neighbors across the street to share. I thought the combination of squash and peppers, roasted until all their juicy Fall sweetness comes through, and the heat of the cayenne and other spices such as nutmeg and allspice made for a really complex flavor combination that you don't get too often in chunky Fall soups. I will return to this recipe again, I'm sure. And, taking Ben's cue that there's no better accompaniment to soup than a grilled cheese sandwich, I served the soup with grilled camembert, provolone and fig sandwiches that were deliciously rich. All together, a perfect Fall meal.